We covered almost all the Open Authentication (OAuth) login systems for Facebook, Twitter, Google plus and Instagram, but unfortunately I missed most important Google Open Authentication login. Today I want explain how to implement this for your web project, this script is very quick and sure it helps you to increase your web project registrations. You can find this in src folder, here you have to configure application OAuth keys, Consumer keys and redirection callback URL. Good job, only i recommend you, and learning readers dont use never mysql_* functions of php, its better other drivers like PDO. If you can in future posts Srinivas use PDO. what about returning clients after registering? mysql_ functions are used throughout all tutorials and examples over the net. the developer is responsible for writing the proper code for his project. Never use an example code for live projects. The tutorial is only used to grasp the logic behind some action - not to be used "as is". As always a great tutorial. Well written and easy to follow. I like your tutorial, Is that the API used in this tutorial is the latest version? 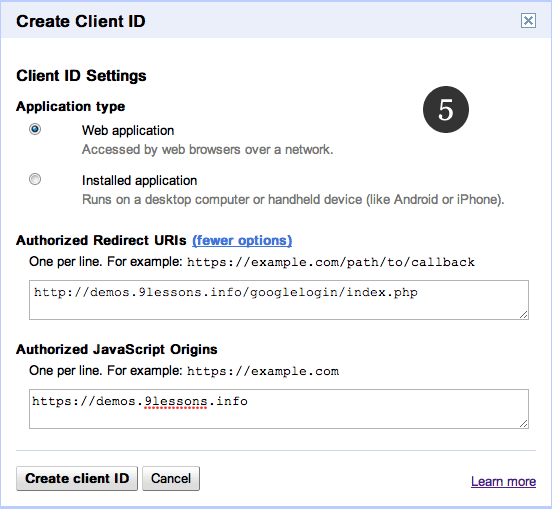 Great tutorial and demo for Google ID authentication! Rock on! Just FYI if anyone have some problem with headers, run session at index.php on first line. How can I get someone's bio? Can you also give me the link to the API documentation for this Google library because I can not find. you are always rocking i will try same using java thanks for explanation.....!!! @Srinivas Can you do the same thing for Twitter with API 1.1? Good tutorial.. but 1 bug?? 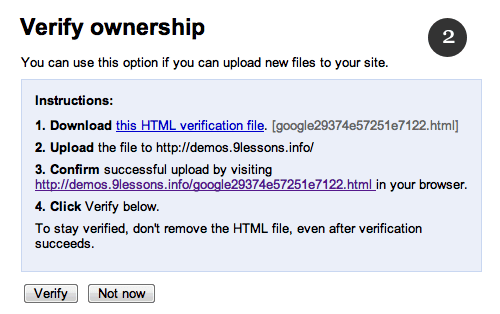 http://demos.9lessons.info/googlelogin/home.php loads even after i log out!!! 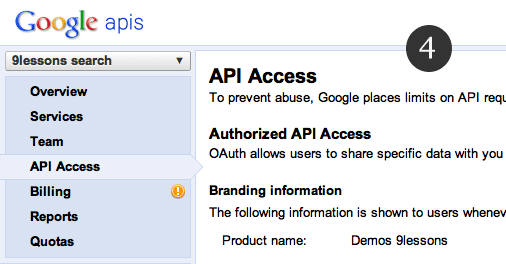 Important: OAuth 1.0 has been officially deprecated as of April 20, 2012. It will continue to work as per our deprecation policy, but we encourage you to migrate to OAuth 2.0 as soon as possible. Please tell how to change the permissions??? Very nice tips, thanks for sharing! Any chance you'll combine this with your Facebook, Twitter, and Yahoo oauth logins to make one nice library? Its realy cool to use this auth method. Hi , i have an error, can you help me? Good tutorial. But how can i logout from google using this code? That is, even i logout from ur demo, I can access my other google applications (like gmail, blog, etc) diectly. how to download i can't able to download this code !!!! It doesn't really logout! 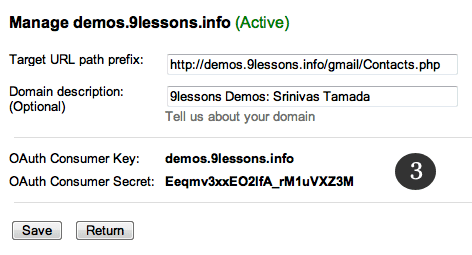 If I go back to the http://demos.9lessons.info/googlelogin/home.php after logging out it still has me logged in and displays my google account basic info.. any solution? It's great tutorial! But i have problem with download source :( I have tried with 3 different accounts and nothing :( Could you help me with it? Nice script but its toooooo big with many folders and files !! for why ??. 300kb ?? wanna a script with just 2 or 3 files . i found one script but i couldnt get gender and guid from it. this script is easy but BIG. Thanks for sharing. i need help, its always asking permission every login. how to skip it? hi its a good tutorial it helped me. i want to display all the posts from my google plus page to website. How can i do this? i was able to get only those posts which are posted by the owner. I am trying to fetch the posts posted by others on my timeline in google plus. how to change or reset the consumer key/secret? 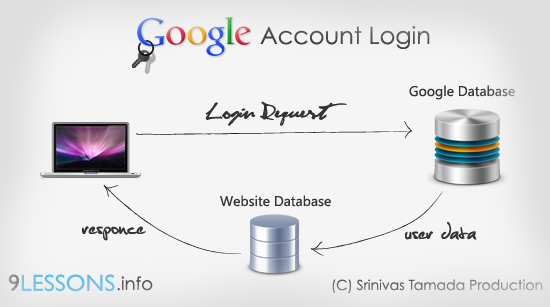 I am also using Google api but In my api it asks for two time to login (Only first time or when I delete all the history of my browser including cookies and all). ho do I add state=THE_STATE_PARAMETERS in the above example?